The below mentioned example, as you can see it, is a 2*2 matrix. To perform operations using standard java,we’ll need to write many lines of code.But with jblas, we can do it in a single line by using jblas methods. Let’s create couple of 2*2 matrices. We will use these matrix to manipulate inbuilt jblas methods . dm1.sum() – Finds the sum fo all elements in a matrix. dm1.rows() – Finds the number of rows in a matrix. dm1.colums – Fins the number of columns in a matrix. dm1.add(dm2) – Adds two matrices. dm1.sub(dm2) – Subtracts two matrices. As you can see, we can perform matrix without calculation in just one line. To know more about how to use these functions, read my article on “_______”. Add jblas dependeny in pom.xml file of maven project. Clone repository from github and install locally. Open Eclipse - > Project -> New Project -> Other -> Maven Project ,add group id and artifact id like i am using groupid - “com.numahub.demo” ,artifact id – modulePractice and click Finish. Here group id , artifact id and version values are fixed as discussed earlier for jblas dependency. Click OK and save pom.xml.This will add dependency in your project. If it runs fine which means jblas dependency is working fine. 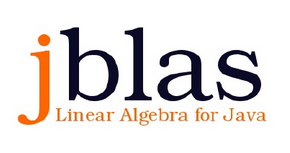 Now , you can use jblas directly as you can see in below picture .